Our neighbors remodeled and say they now have a “wet” bathroom. What is a wet bathroom anyway? Great question! The “wet bath” has long been the standard for many countries around the world and now making its way into the design minds here in the United States. Chances are if you’ve stayed in a hotel, you’ve already experienced one. Simply put, a wet bath is a bathroom – sink, shower, tub, and toilet – that is finished so that all surfaces can be wet or damp. Typically, a shower curtain or shower glass is needed to protect surfaces near a bathtub or shower, but not in a wet bath. 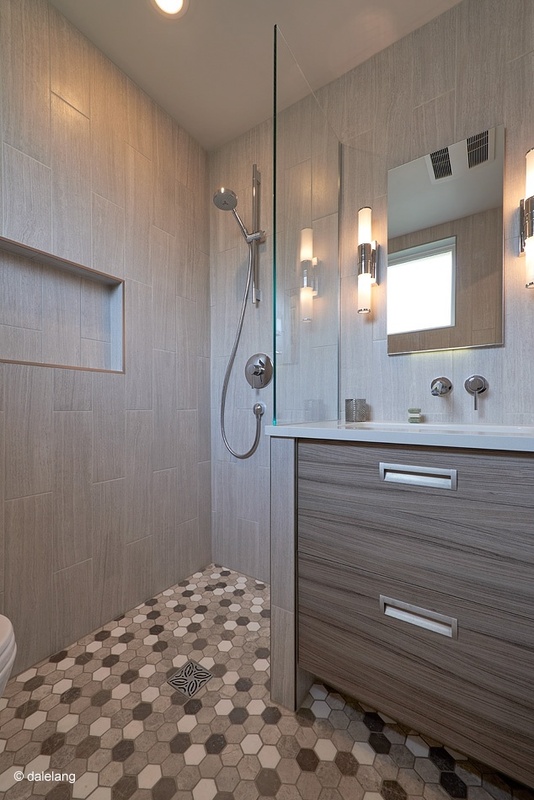 Tile is used on all floor and wall surfaces, and the whole space is waterproofed by a professional tile installer. One benefit is that wet baths allow for open, modern layouts without the need for shower curtains or glass doors. A side benefit is that they can be created from much smaller spaces. With Seattle bathrooms, space is often at a premium, and the wet bath concept can open up many possibilities. CRD Design Build once used the wet bath concept to create a guest bathroom out of a closet! Remember that you won’t have shower glass to hold in the warm steam from your shower. This is no problem for a small bathroom but can be an issue for bigger bathrooms. The larger the room, the cooler your shower experience will be as the warmth and steam escape into the room. In general, small bathrooms are less expensive. However, there is an added expense in covering all the walls and floor in tile. Stick to an inexpensive large-format porcelain tile for the floors and majority of the walls, and use accent tile to spice up the design. Are you planning a bathroom remodel? At CRD Design Build, we love all the benefits of wet baths and love designing them for our clients. If you are curious about the concept and wonder if it would be right for your home, please feel free to get in touch. And be sure to check out our Pinterest board with lots of inspiring images.